I can't stop poring over the pages of the latest issue of Martha Stewart Living. 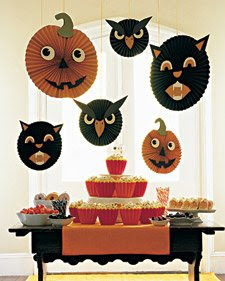 So many fabulous Halloween and Autumn ideas! I've marked too many pages. We all know Martha is the Halloween queen and she's rocking it with this issue. The Halloween Hang-Ups. These are so retro and adorable without being scary. They seem easy enough to make and use simple materials. Martha even provides templates for the faces. A friend and I are going to try them for our church Halloween get-together. I'll let you know how it goes! 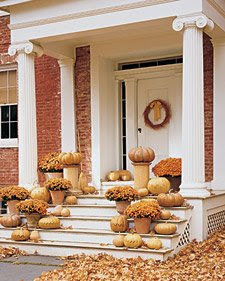 How I adore this lovely front porch loaded with pale pumpkins. This is from the article "A Palette of Pumpkins" that showcases pumpkins of every color and shape, even some in a dusky green blue! 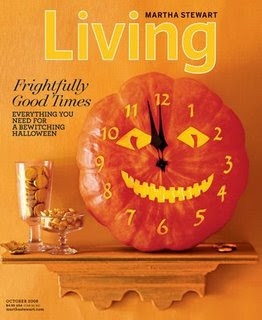 My favorite photo is the mantel piled with golden gourds on page 141. Many of the ideas will actually carry over as Thanksgiving decor. Gotta love that! 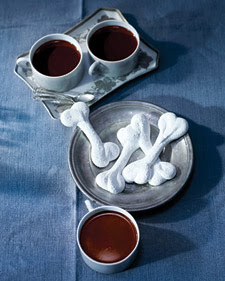 For a bit of fun how about Marshmallow Bones or a Supernatural Buffet lit with black lights? 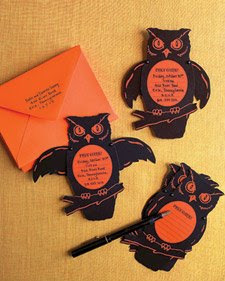 And then the invitations featured in this issue are perfect and easy, too. Just download the templates, cut, attach and go. I love a good template! I think I'm actually a little excited for Halloween this year, thanks to Martha! I too am a complete sucker for Halloween and can't wait! I keep changing my mind on Hugo's costume... Wish we lived closer to one another so that I could make those scary faces with you! The bronzed pumpkin porch is divine! Love it.